SleuthFest, the writers’ conference sponsored annually by the Florida Chapter of Mystery Writers of America, will take place February 25-28, 2016 at the Doubletree by Hilton in Deerfield Beach, Florida. The Keynote Speaker, CJ Box is a NY Times best-selling author, winner of the Anthony, Macavity, Gumshoe, Barry, and Edgar Awards. The Florida Guest of Honor, the NY Times bestselling P.J. Parrish team of Kris Montee and Kelly Nichols, have won the International Thriller Writers, Shamus, and Anthony Awards. The Forensic Guest of Honor is Valerie Plame Wilson. 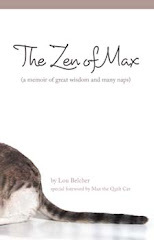 Interviewing Ms. Wilson will be NBC’s Kerry Sanders and national best-selling author Paul Levine. SleuthFest is known as one of the best conferences in the country for writers of all genres. There are four tracks of workshops, presentations, and panels in writing craft, business, traditional and self-publishing, marketing, and forensics. In addition, top literary agents and editors will hear pitches from budding writers, and offer troubleshooting sessions and manuscript critiques. For many writers, SleuthFest is where they met their agent or editor, resulting in their book being published. It’s a great opportunity. The welcoming atmosphere at SleuthFest is what attracts many writers, both fiction and non-fiction. It is clear from the moment an attendee arrives, that everyone there wants to help them succeed. And there are plenty of social events where writers can do that all-important networking. The contacts a writer can make are reason enough to attend. The roster of past Keynotes and Guests of Honor includes Sue Grafton, Robert B. Parker, Dennis LeHane, James W. Hall, Dr. Henry Lee, Dr. Michael Baden, Robert Crais, Brad Meltzer, Lisa Scottoline, and Linda Fairstein, et al. 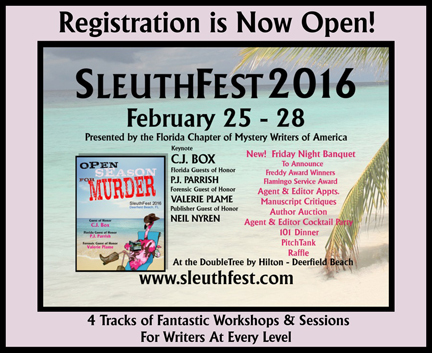 SleuthFest 2016 will take place Feb. 26-28 at the DoubleTree by Hilton in Deerfield Beach, Florida.